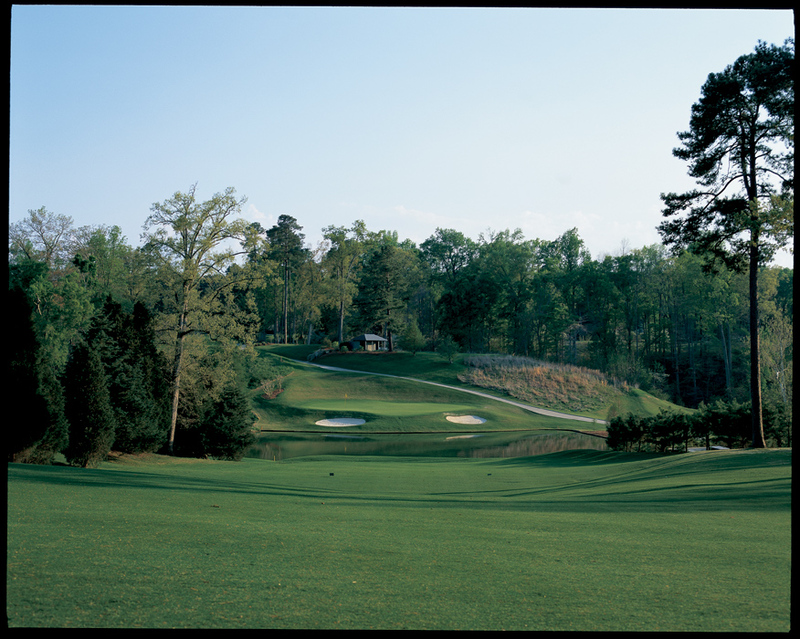 Of the Jones Sr. courses that I have played the Golden Horseshoe remains, in my estimation, one of the finest courses he ever designed. 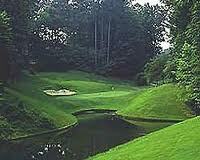 It was built in the 1960’s in a hilly wooded area that surrounds a a natural canal basin-the finished course is a product of it’s surroundings. It bears similarity to Spyglass Hill which was built in the same time frame, a course that the pros consider one of the most difficult courses they play all year. Much like Spyglass this course was carved out of a densely wooded area-tall trees ensconce every hole and give the course that distinctive cathedral-like feeling. Much like Spyglass the holes meander up and down seriously hilly terrain presenting the player with the challenge of evaluating elevation change on almost every shot. Throw in a little wind and the tunnel effect caused by the tall trees and you have a difficult mental challenge in club selection on every shot. Esthetically this is one beautiful golf course. There are more maintenance people per player than you will see anywhere. Every flower and blade of grass is manicured to perfection-it is presented to please the eye and it will not disappoint. This is a mother of a piece of terrain to walk so you will actually be glad to be riding in a cart most of the way. 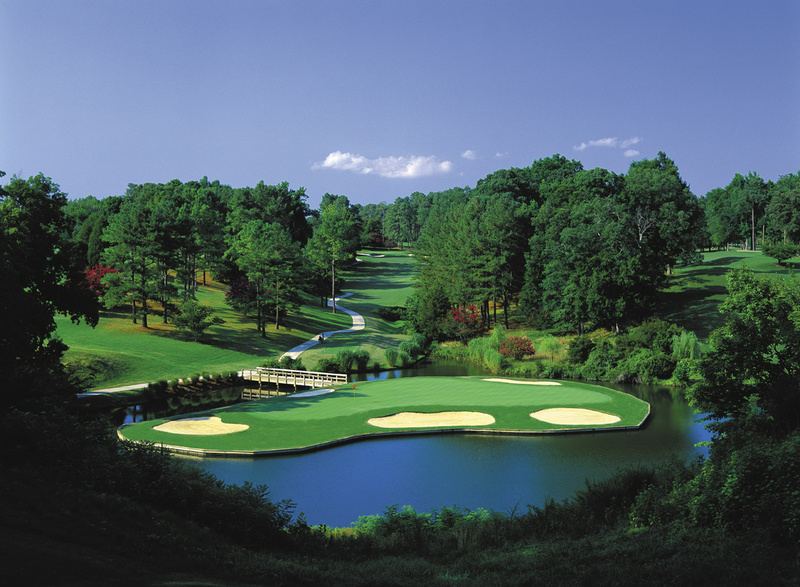 As is characteristic of most of the Jones Sr. courses you see long tees to allow multiple tee lengths, oddly shaped-segmented greens that never give you much target to shoot at, and well placed fairway bunkers that force you to play dexterously for the best line into each green. The greens are very undulating and segmented which puts a premium on getting your ball to the correct tier and further pressures you to get the correct driving position for an advantage angle at the flag position of the day. The only characteristic missing from most of the Jones Sr. courses I have played are the large sprawling amoeba-like bunkers with which he loves to intimidate players-but the green side bunkers are deep and well positioned to swallow a shot without conviction so you will end up with sand between your toes before the day is over. In spite of the fact that the overall yardage does not seem intimidating it is a driving course-long drives on the right line are requisite to scoring well here. The trees and bunkers clearly define the driving lines-you must hit them if you are to have a bats chance of hitting these segmented greens. Concentration and correct club selection on the tee box is very important. Mindlessly blasting your driver on every hole will lead to lots of troubles and doubles on your scorecard. Which brings to mind one of the cardinal rules of The Shoe-if you hit it in the trees take the most direct and shortest route out. Anything bold or macho will be punished by Trent’s ghost-there is very little air in these trees. As is the case with most great courses you have to be intelligently aggressive to score well here. When you have the right angle to a flag or the putt from the correct side of the hole you have to go for it. On a course like this you have to put some cash in the account when you have a chance because there will be debits coming due on some of the harder holes during the day. The middle holes require you to score well because the beginning and the end will not offer you much opportunity other than survival. The par three holes are easily the most difficult scoring holes on the course. All four are nested around the basin in the middle of the property with serious elevation change and always a smattering of wind. To murk your decision making further three of these holes have at least three tee positions they can use so the club selection can change two clubs from one day to the next. These are four of the most challenging and breathtaking par threes you will ever play on one course. The last five holes are the hardest run of the day-one of the toughest finishes if you are clinging to a good score. Only the last four at Avenel or the last five at TPC Sawgrass come close. It is especially difficult to face this challenge late in the round when you are tired. I have played this course a dozen times and I still find every round I play here full of intrigue and delight. It is the type of course I think you could play every day and never get sick of it-the facets of the architecture-the beauty of the surroundings make it a real treat time after time. There is no course I have played in the states-except Pebble, Pinehurst 2, Merion, and Oakmont-that has left a more indelible mark on my golf psyche. Touche Mr. Jones! This entry was posted in Virginia by moegolf. Bookmark the permalink.